Earn 13.2 SB per $ when you buy Spa & Wellness gift cards at MyGiftCardsPlus, powered by Swagbucks. 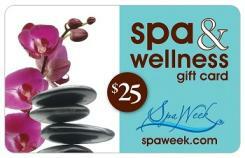 The Spa & Wellness Gift Card is the perfect way to put yourself and your loved ones on the path to personal wellness. The ideal gift for every occasion, when you receive a Spa & Wellness Gift Card, your choices are endless (and it’s hard to go wrong!) as the card is accepted at over 8,000 spa and wellness facilities across the US, Canada and Puerto Rico, never expires and has no added fees. Treat yourself, friends or loved ones to some much-needed and well-deserved relaxation with a soothing massage, facial, or manicure—even attend a yoga class! Visit us today at www.spaweek.com to find the perfect spa experience or wellness retreat near you. !